PSA is the use of analgesics, sedatives, and dissociative agents to perform urgent painful and emotionally challenging procedures on patients in a humane, safe and controlled fashion. 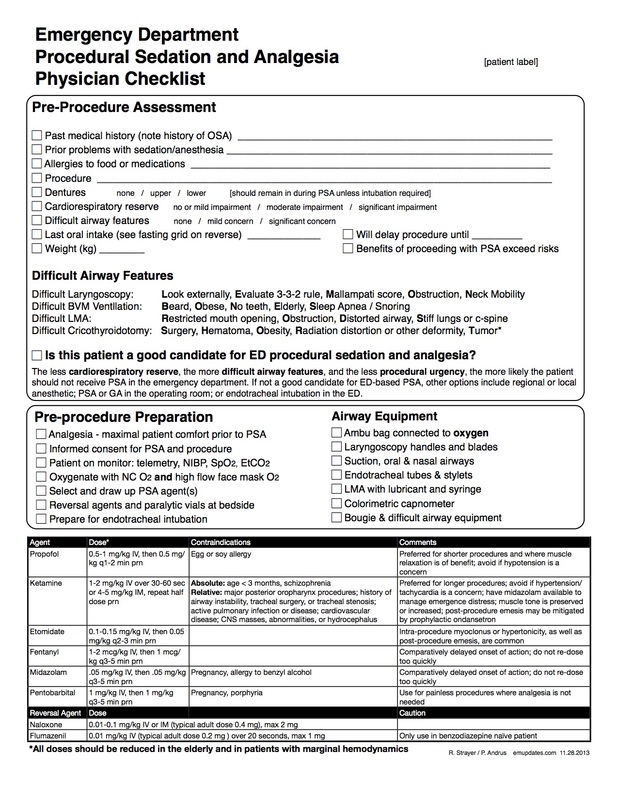 What makes PSA possible in the ED is the comfort of EM docs with a host of sedative agents and the ability to prepare for and handle any complications stemming from sedation. For quick reference we’ve distilled the most commonly used PSA meds their doses and some of their nuances. Vital to safe and effective PSA is preparation. 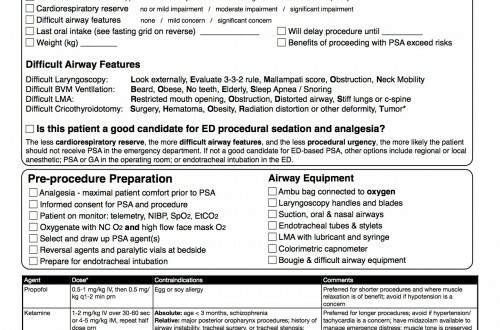 Checklists are an indispensible tool to help methodically ready our patients, our collegues, our environment and ourselves to perform vigalent and controlled PSA. 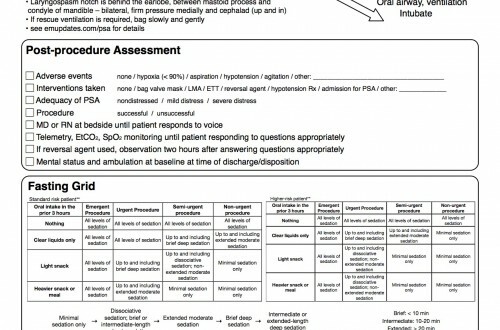 Ruben Strayer From emupdates.com has prepared the PSA checklist that we find the most compelling. 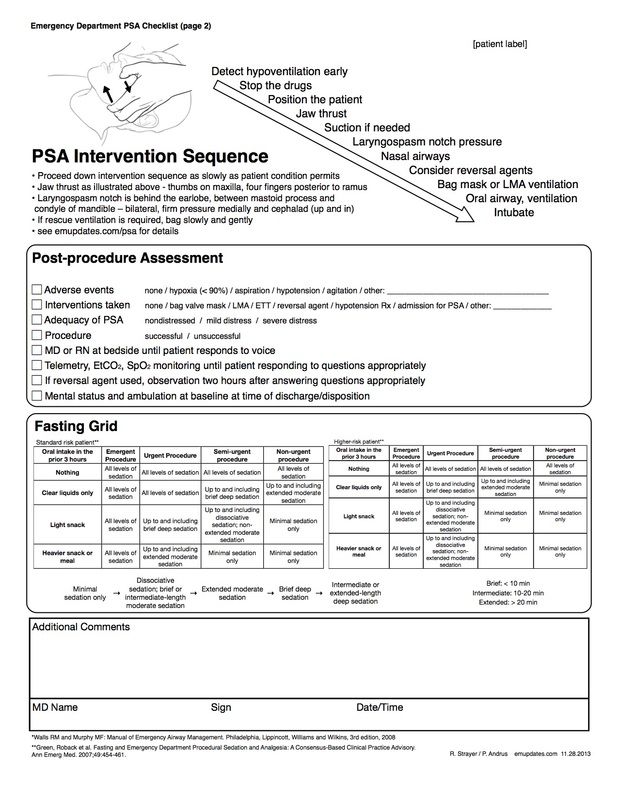 Part one covers how to think about and prepare for PSA, including a discussion of fasting guidelines. Part two describes how patients are harmed during PSA and how to prevent patients from being harmed during PSA. Part three discusses contemporary PSA pharmacology.